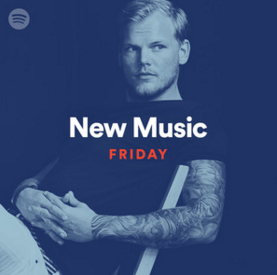 The late Avicii appears on the cover of Spotify's New Music Friday, behind the release of his first posthumous offering, "SOS" (Geffen), which features Aloe Blacc. Featured at the top of the set are BTS f/Halsey's "Boy With Luv" (Bighit/Columbia) and LSD's "Heaven Can Wait" (RECORDS/Columbia) from their just-released albums. Other highlights include Ellie Goulding's "Sixteen" (Polydor/Interscope), ScHoolboy Q w/Travis Scott's "CHopstix" (TDE/Interscope), Tame Impala's "Borderline" (Modular/Interscope), Marshmello & SOB X RBE's "Roll The Dice" (Joytime Collective), Kevin Abstract's "Georgia" (Question Everything/RCA), Mark Ronson f/Lykke Li's "Late Night Feelings" (RCA), Anderson .Paak f/Brandy's "Jet Black" (Aftermath/12Tone), Cage The Elephant's "Goodbye" (RCA), KAYTRANADA & Van Jess' "DYSFUNCTIONAL" (RCA), Chris Brown's "Back To Love" (RCA), iann dior's "emotions" (TenThousand Projects), P!nk f/Cash Cash's "Can We Pretend" (RCA), Col3trane & FKJ's "Perfect Timing" (AWAL), blackbear's "Dead To Me" (Alamo/Interscope), Oliver Heldens f/Devin & Nile Rodgers' "Summer Lover" (RCA), Omar Apollo's "So Good" (AWAL), Jessie Reyez w/6LACK's "Imported" (FMLY/Island), Maren Morris' "Kingdom Of One - music inspired by Game of Thrones" (Columbia), The Lumineers' "Nightshade - music inspired by Game of Thrones" (Columbia), Beast Coast f/Joey Bada$$, Flatbush Zombies, Kirk Knight, Nyck Caution & Issa Gold's "Coast/Clear" (Columbia), 070 Shake's "Morrow" (G.O.O.D./Def Jam), Courtney Barnett's "Everybody Here Hates You" (Mom+Pop), Keith Urban's "Burden" (Hit Red/Capitol Nashville), Lil Peep's "Gym Class" (Lil Peep), Hey Violet's "Better By Myself" (Capitol), The Raconteurs' "Hey Gyp (Dig The Slowness)" (Third Man), Vanic f/Saint Sinner & Wifisfuneral's "Forever Down" (Disruptor/RCA), MISSIO's "Underground" (RCA), Asher Angel f/Wiz Khalifa's "One Thought Away" (HITCO), Smokepurpp's "Remember Me" (Alamo), Dylan Cartlidge's "Higher" (Glassnote/AWAL), Tom Morello f/Gary Clark Jr. & Gramatik's "Can't Stop The Bleeding" (Mom+Pop), Andy Black's "Heroes We Were" (Lava/Republic), Elle Varner's "Kinda Love" (eOne) and Norah Jones' "Begin Again" (Blue Note/Capitol).